Everyone puts great pressure on availability: monitoring and reporting, event management, keeping unavailability periods as short as possible. This guide will explain you how to automate monitoring-related tasks with Buddy’s unique pipelines triggered recurrently and facilitate the workflow at your support center. Learn the concept of a pipeline run recurrently. Find out how it can help you automate monitoring-related tasks. Set up monitoring for your website using pipelines. This guide assumes that you already know Buddy and its powerful pipelines. If not check out our pipelines guide. Recurring pipelines are triggered automatically at a specific time. They are perfect as far as monitoring is concerned—will check whatever you want to check automatically, promptly and without your help and report the results in a way you prefer. To show you how to set up a recurring pipeline in Buddy, we’ll work with the pipeline checking if the site we need to monitor is available and if the text we expect to find there is actually there (the text is an evidence the site is loading properly). Pick Add a new pipeline. Pick Recurrently as the trigger mode. Pick None in Branch assignment section. Set interval to 1 minute. This is how often the pipeline will be triggered. Set the start date from which the pipeline should be active. Now it’s time to add actions to the newly created pipeline. In our case we’ll add three. 1st to monitor a website, which sends request to the given URL and checks for a string to make sure that the site is not only online but also delivers the right content. 2nd to send SMS notification if the site is unavailable, the developers will receive a notification. 3rd to send SMS notification when the site is available again, the pipeline will also notify the developers it’s working (what a relief …). Any time you want you can check what the pipeline is currently doing, but this is not very thrilling (handy—yes, thrilling—not that much). What’s cool is the execution report, with execution times and days with incidents marked. The report is a perfect tool to improve your incident management processes. Recurring pipelines have many practical applications besides monitoring web sites. Recurring pipelines can be employed to trigger integration tests once a day at night. Running through the entire test suite can take much time. In our case (Selenium-based scenarios) total testing time amounts to four hours. We need (and want!) to run the scripts, but not on every push. Thus we set up a recurring pipeline that triggers tests after hours and only in case of changes in the code. 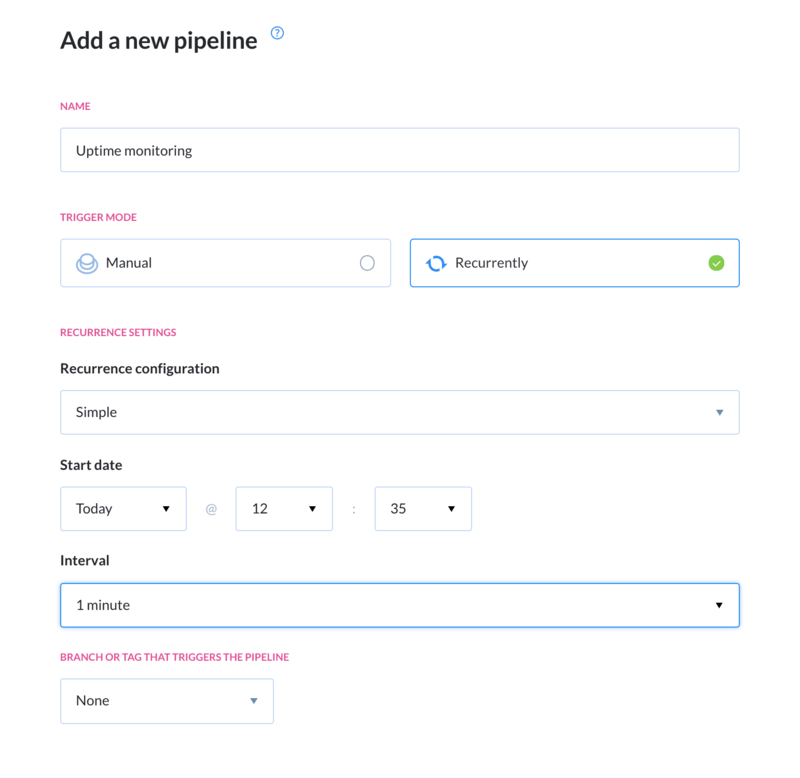 Other possible tasks you can automate with recurring pipelines are deliveries, scheduled at specific intervals. The perfect job for recurring pipelines is also performing backups of whatever you need to backup at certain intervals. You can also combine recurring pipelines with other types of pipelines in Buddy. If you want to learn more about the pipelines and find out if they can help you solve other problems, check out this guide. Now you’re ready to automate monitoring-related tasks with Buddy. We also mentioned a bunch of other jobs recurring pipelines can do for you. This is just a small sample of Buddy’s abilities. If you are interested in our solution, you can read more about Buddy in other guides. If you have any further questions, don’t hesitate to contact us at support@buddy.works! Monitor websites for downtime and get notifications to Slack and mobile.